A dynamic website creates a virtual office. It can be used to manage the operations from any place or location. It provides integrated Interface for business administration. 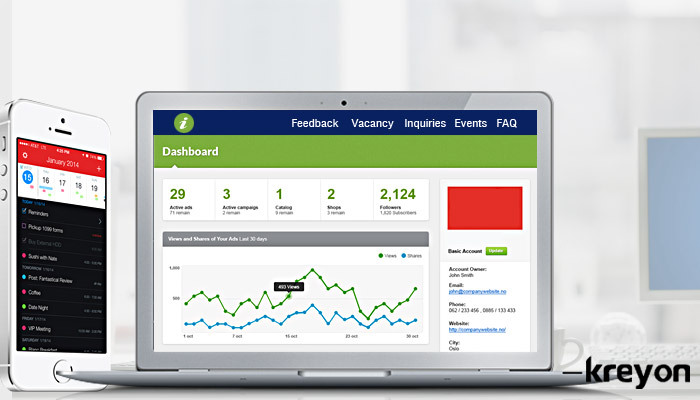 The key parameters governing performance can be monitored online with triggers for new business enquiries, total visitors, employee activity, escalations and other important events. The web is a great place to attract young talent and also showcase your business. A dynamic website can be used not only to create a compelling & attractive careers page, but can also manage online hiring process. The open vacancies can be published on the Vacancy page and candidates can submit online applications. The shortlisted candidates can be notified & then interviewed as per the needs of the business. One of the most important aspects of a website is to generate sales for a business. The products and services page can highlight the unique selling proposition to visitors. Apart from that the portal can also manage terms & conditions, quotations for products/services, which can be sent to prospective customers. A business can post press releases and news on their website. Once these press releases are published, its impact on the visitors can be analysed and measured. The press releases that generate maximum traction for the business can be tracked. The message for the target market can be refined with real time tracking of these press releases. Organisations can make their PR efforts more focused, impactful & appealing with this. The dynamic portal can facilitate easy interactions with visitors, prospective & existing customers for an organisation. The feedback page on the portal can be used to connect with them. When a new customer enquiry or feedback is posted, relevant authority is notified with automated messages etc. The action pertaining to feedback can also be tracked & assessed for improving customer satisfaction. Documents are pivotal to running a business. Organising them can be fairly complex though. An online document management system can be integrated with a dynamic portal. Documents can be shared to relevant staff and also made accessible at a centralised location with a company portal. Important documents for expenses, budget & project related documents etc. can be maintained using a digitised document system. Content management is a necessity for online reputation & branding. A business can create a blog which can be used to create awareness about its products & services. Companies can add content, images, videos and stories dynamically to keep their website fresh & updated. The traction of the blog can be measured and assessed with a dynamic website. For e.g. the popularity of an article can be gauged with the number of shares on social media channels like LinkedIn, Twitter, and FB etc. At the same time, the web leads & business generated from these efforts can also be tracked with a dynamic website. partner enquiries etc. The website can be used to manage these opportunities centrally, qualify them and then take actions as per business priorities. The website acts as an important tool for publicising the key events for a business. These events can be notified to subscribers, prospective customers & even staff. The events calendar, meetings and milestones can be managed with a web interface. Businesses can also manage offers, discounts, and announcements using this feature. For e.g. a retail store may publish an event related discount on their website to attract visitors & business. A dynamic website can personalise interactions with customers. Companies like Netflix use business intelligence to personalise suggestions for each user. Amazon sends personalised suggestions for product purchases based on user’s history. Your business can also manage customers and their history on their dynamic website & create a personalised service or experience. Businesses are also automating their invoice systems and collecting payments online from their customers. Customer management with best in class technology tools is a sure fire way to grow a business. Internet is by far the most powerful growth engine for businesses today. Traditional brick and mortar companies are looking at ways to tap into the magic of internet. A dynamic website offers them a potent combination of functionality not only to attract new customers but also enhance operations, management & growth. It allows an organisation to create an optimised strategy for maximising business performance with a single integrated view of data.